Prior to making his sublime feature film debut, Sundays and Cybele (Les Dimanches de Ville d'Avray, 1962), Serge Bourguignon made documentary films in East Asia. 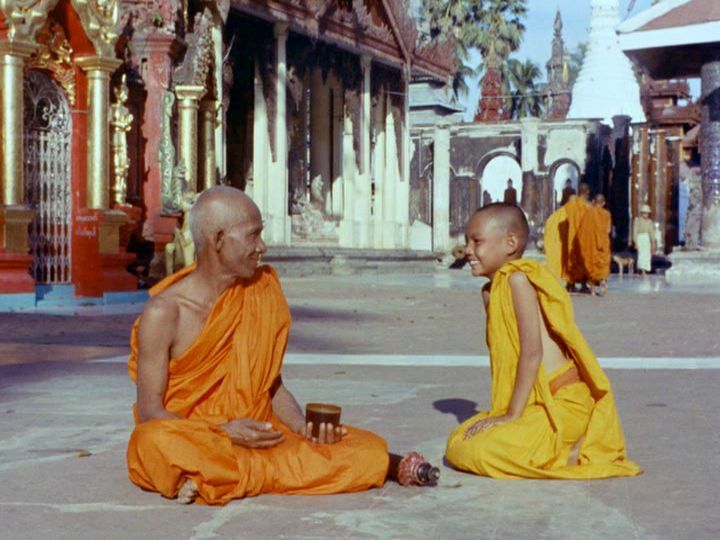 The most celebrated of these was his short "documentary" about a young novice Buddhist monk in Burma, Le Sourire (The Smile, 1960), which won the Short Film Palme d'Or at the 1960 Cannes Film Festival. This 22-minute film follows an afternoon’s journey by two Buddhist monks, an elderly monk and a ten-year-old novitiate, as they travel on foot from their monastery to a great holy pagoda in Rangoon (Yangon). There is no dialogue in the film, just some atmospheric music by Georges Delerue and some brief voiceover by Michel Bouquet. Although the film has the character of a documentary account, it is clear that the scenes are carefully staged by Bourguignon and cinematographer Louis Miaille, with smoothly edited closeups where appropriate. Aung, the young novice on whom the film is primarily focalized, strives to evince monastic solemnity like that of U Narada. But, of course, he is an innocent young boy full of the wonder of life. 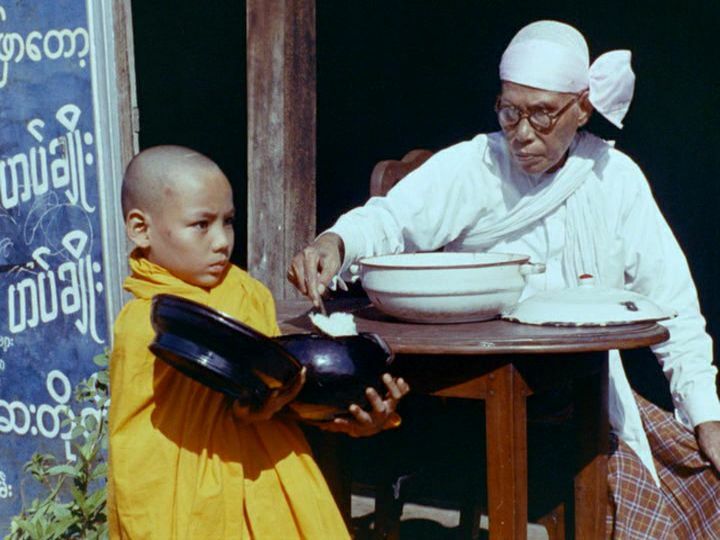 Initially Aung and U are separately seen at a local market presenting their alms bowls to market stall attendants. In imitation of senior monks like U Narada, Aung adopts a frowning countenance, which he presumably feels is a required demonstration of detachment. 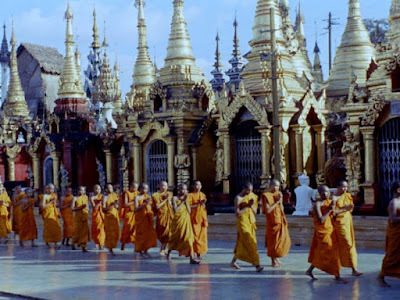 Then U and Aung head off together on their journey to Rangoon. Along the way, Aung stops for distractions he sees, and he keeps falling behind U’s disciplined pace. 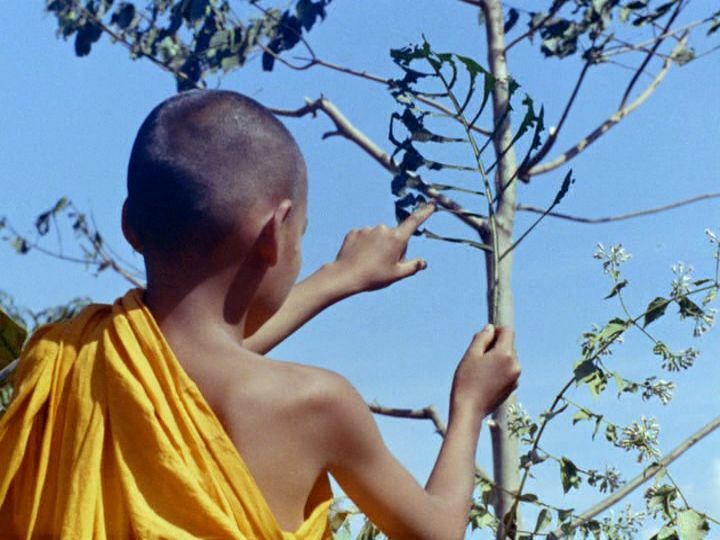 But these distracting encounters, which can be taken as metaphors about nature and life, make up the core of the film. Most of them wind up eliciting smiles from the curious boy. Running along to catch up to U, Aung stops to avoid stepping on a large beetle, which he picks up and safely deposits in a bush. Then he is further distracted by the sight of a water buffalo, and he crawls up to it so he can pet its horns. This encounter makes him smile, and then he rushes off to catch up with U.
Aung is distracted by a colorful butterfly and then by the pattern of a large leaf. He takes out part of the leaf’s inner sections in order to form an interesting branched pattern, whose resulting branched structure he likens to that of a large tree that he sees in front of him. This also makes him smile. Up ahead, U impassively strides past a village jujutsu-like wrestling match. But Aung following along is fascinated and briefly stops to watch. Aung is also fascinated and smiles when he sees some young women at a water well playfully throwing water at each other. Later an older women smoking under a tree beside the road ignores U as he strides past, but she offers some food as alms to Aung when he runs by a bit later. Again Aung smiles. 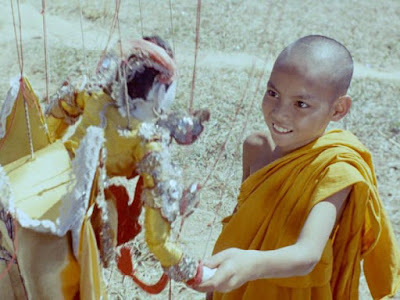 Then Aung is fascinated to see some carnival performers practicing with their marionettes. They playfully perform for Aung, and the boy smiles. “He who desires nothing is at peace. He who possesses nothing is at peace. He who lives on alms is at peace.
. . . no insect will sting him. . .no serpent will bite him. Give the love in your heart to creatures with no legs. Give the love in your heart to creatures with two legs. Give the love in your heart to creatures with four legs.
. . . to fire and air give the love in your heart. . . . In the end Aung, with a serious expression now on his face, bows down to U and offers his cup to him. This time, though, they both break out into irrepressible smiles, in a harmonious exchange of benignity. Le Sourire is a contemplative film that avoids dogma and is open to your interpretation. 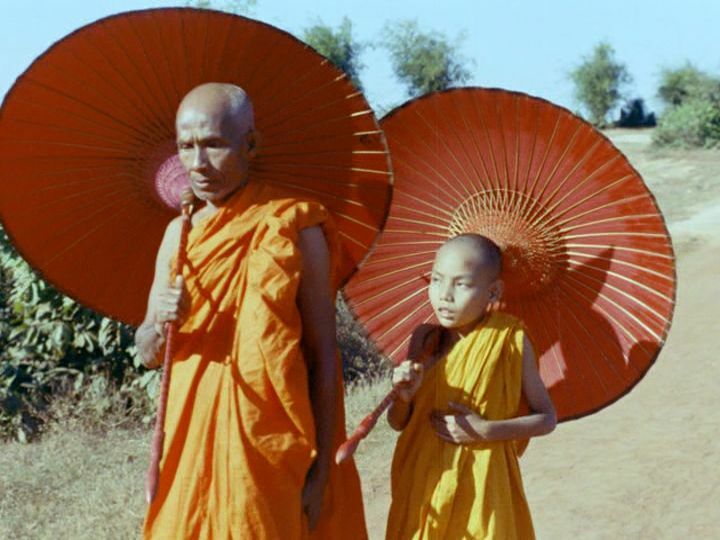 To me the two perspectives of U Narada and Aung are complementary. U Narada embodies the peaceful serenity of nonjudgmental and compassionate acceptance. But Aung embodies an equally important perspective – the innocent joie de vivre that promises benevolent engagement. It is positive engagement, not withdrawal, that raises us up to enlightened existence. This is signaled throughout the film by Aung’s infectious smile. Serge Bourguignon’s filmmaking career was just taking off with this film, but unfortunately it soon stalled. Despite the greatness of his subsequent work, Sundays and Cybele, which led to an invitation to direct films in Hollywood, he was only able to make a few modestly received films after that resounding success. But Le Sourire is still a compelling and interesting achievement, and we can be thankful that it served as a doorway to the making of Sundays and Cybele.